Ireland’s fourth previously-capped player Jacob Stockdale has been retained by Ulster for Pro12 duty. 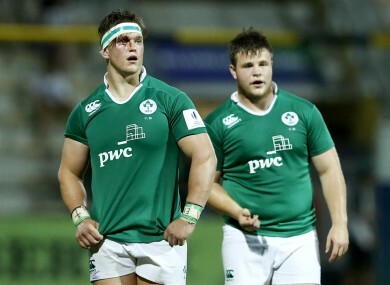 Porter and O'Donnell in action against New Zealand during last summer's Junior World Championship. IRELAND UNDER 20s coach Nigel Carolan has handed out 12 new caps for Friday’s Six Nations age grade opener at home to Wales (Donnybrook, 19.35). Ulster back Jacob Stockdale is missing from the ranks as Les Kiss has kept him within the northern province’s ranks for the Pro12 clash at home to the Dragons. The three other squad members with experience at this level are in the front row. Powerful loosehead Andrew Porter will lead from the front alongside Adam McBurney and Conan O’Donnell. Lansdowne lock James Ryan captains the side from the engine room with Connacht’s Cillian Gallagher joining Leinster’s Will Connors and Max Deegan in the back row. Behind the scrum, Johnny McPhillips and John Poland will steer the team from half-back with Cork Con’s Shane Daly appearing to be the chief benefactor of Stockdale’s absence as he takes the number 13 jersey. Email “Experience in the front row, first taste for the rest of Ireland under 20s”. Feedback on “Experience in the front row, first taste for the rest of Ireland under 20s”.